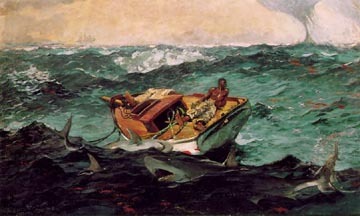 "Permanent Stain" a new play by Lisa McCree, is influenced by 19th Century Artist, Winslow Homer. His impression was that of the helplessness of humans before their fate, as in the "Gulf Stream." This Play mimics the scene of tumultuous waters with choreographed and swift moving dialog, as the helpless victim pleads for his life. In "Gulf Steam" a man is trapped in a boat in the middle of shark infested waters; in "Permanent Stain" a man is lodged in the windshield of a car as Mallory, age 27, manipulatively orchestrates a crew to help her dispose of the mess. Saturday, January 31st at 1:00 pm. 300 West 43rd Street, 3rd Floor.